As always, a stump paste that is Safe and Easy to use and a highly targeted way to deal to the weeds that respond best to Metsulfuron such a Chinese privet, Rhamnus, Ginger, Agapanthus and Arum Lillies. Great for those wanting to avoid Glyphosate products. Met Gel contains a minimum of 10g/L Metsulfuron methyl. MetGel is ideal for Chinese privet, rhamnus, ginger, arums, agapanthus and other plants that respond well to metsulfuron. 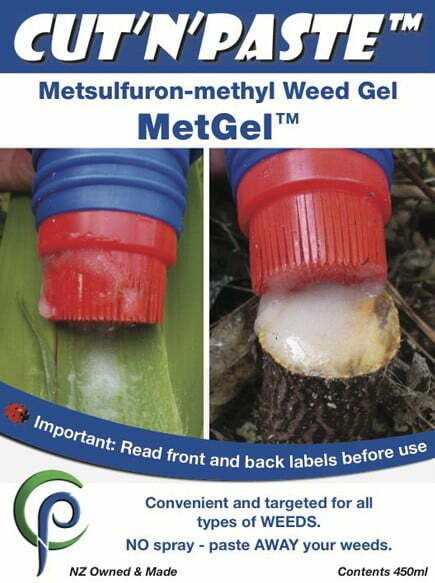 MetGel can be used for weed control either as a stump paste or wiped onto the underside of leaves of leafy weeds. Plant treatment with leaf paste can take 6 months to begin to die off. Plants which are stump treated should not regrow. MetGel is ineffective on solanaceae species such as tobacco weed and datura. And our standard order form applies with the price for MetGel the same as our Bamboo Buster product with a 450ml brush top bottle applicator. Orders may take a little more time to produce than our other products so allow a week for delivery. The product is best used in a short time period. Metsulfuron can travel through soil in water columns affecting non target plants and care you are advised to take care not to spill or drop gel on the ground when used anywhere near water courses. MetGel is recommended for professional weed control operatives. Metsulfuron will spread through entire plant to roots. Metsulfuron can leave a very active residue in the soil, apply with care as the gel works at very low rates. Normal metsulfuron safety procedures are advised. http://www.orioncp.co.nz/products-listing-web-app/mustang This is an example of a metsulfuron product.